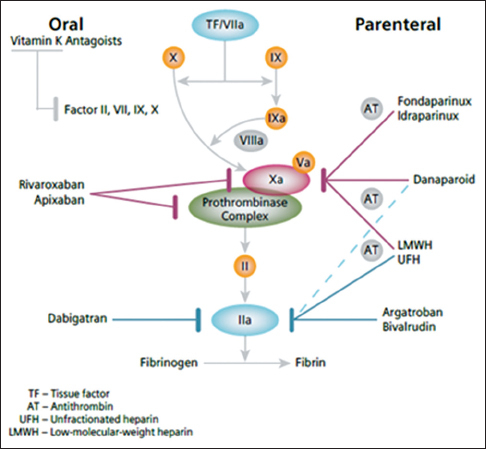 In recent years, numerous alternatives to VKAs have been developed, the first competitors to warfarin are the novel oral anticoagulants (NOAC) or better referred to as Direct Oral Anti-Coagulant (DOAC) or Target Specific Oral Anti-coagulant (TSOAC): These drugs have definite advantages and disadvantages that should be clear to the physicians before prescribing any of them for patients. Many clinical trials, which involved thousands of patients provided definite information about the efficacy and the safety of DOACs, yet, many physicians remain reluctant to prescribe these drugs due to lack of answers to real world questions. The concerns are directed towards appropriate patient selection (The choice should be made according to age, renal function, compliance, cost, clinical condition, intake of other drugs), the mechanism of switching between agents. How to manage regarding any procedural measurement? How these drugs affect routine laboratory tests and when do we need monitoring? Knowledge of other drugs that interact with the DOAC and management of severe bleeding will be reviewed and recommendations will be given to all these concerns. Background: Donor reaction has the most negative impact on the blood donor return rate. Amelioration of some adverse events has the potential to improve return rate. This study was initiated with the aim to determine the frequency of various adverse reactions. Materials and Methods: The study was conducted over a period of 7 years and 1 month, from July 1, 2007, to August 31, 2014. The donor population analyzed consisted of 27,664 donors (26,557 males and 1107 females). Results: Only 195 donors (0.7%) suffered some adverse reactions. One hundred and fifty-eight (0.57% of the subjects) had mild reactions (agitation, sweating, giddiness, pallor, cold feeling, sense of weakness, nausea), and only 37 (0.13% with 10 females and 27 males) had more severe reactions (including vomiting, fainting, loss of consciousness, and convulsive syncope). Conclusions: Although the number of donors who developed adverse reactions during or immediately after the blood donation was very low, still it is very important to reduce risks to a minimum so that donor return rate could be maintained. Background: Blood donor deferral is a painful and sad experience for the donor, organizer as well as screening doctors. The rate and reasons of deferral differ from region to region and center to center. The shortage of safe blood donors is frequent, and it is important to understand the causes of deferral in voluntary donors. The aim of this study was to analyze the incidence of donor deferral, causes of deferral, and apply relevant findings to modify the recruitment strategy to decrease the temporary deferral rate. This strategy could increase the pool of voluntary donors without compromising on the quality of the blood and safety of the recipient. 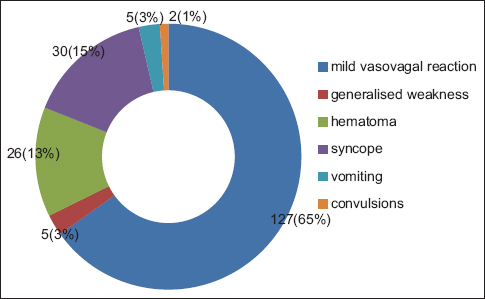 Materials and Methods: Data from voluntary blood donation camps held in the blood bank and outdoor camps from August 2014 to August 2015 were analyzed retrospectively. Based on the history and physical examination findings; all blood donors coming for the donation were classified into fit for donation or deferred donor. Results: A total of 24,062 subjects registered for donation during the study period (August 2014 to August 2015) out of which 4125 were deferred prior to donation. The incidence of deferral was 17.1%. Most common reasons for deferral were anemia (2107 out of 4125) accounting for 51% of deferred donors, abnormal blood pressure 6.8% (281/4125), and history of medication 18% (743/4125). Majority of them were temporary deferrals 86.1% (3822/4443). Permanent deferral accounted for 13.9% (621/4443). Most of these deferred donors were aged between 18 and 30 years old. Most common reason for deferral in males and females both was anemia with an incidence of 32.7% (900/2750) and 87.7% (1207/1375) in males and females, respectively. Discussion and Conclusion: Insight into the reasons of donor deferral is very important to avoid the permanent loss of the donor as blood donation program is the life force behind any blood bank or hospital. Deferral study also indicates the health status of the general population. Since most of the deferrals are temporary deferrals, and we should give a clear message for the reason for deferral, so that they return for donation in the future. Background: Young adult patients with malignancy are a distinct group of the population. In addition to their ailment, psychosocial issues including fertility issues should be addressed. Chronic myeloid leukemia (CML) is a disease of the elderly population. The outcome with imatinib in young population is not known. Aim: To study the clinical profile and outcome of young patients newly diagnosed with CML on imatinib and to compare with those of elderly population in a tertiary cancer center. 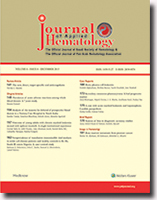 Materials and Methods: 369 patients with newly diagnosed CML were included in the study. Patients belonging to the age group of 20–39 years were used as the study group and those who were more than 40 years were used as controls. Both the groups were treated with imatinib. They were followed up for a period of 3 years. Milestones in terms of achieving hematological, cytogenetic and molecular responses were noted. Toxicity profile of the imatinib and the compliance of the patients were also recorded. Results: A total of 173 patients were in the study group and 196 patients were in the control group. Rates of achieving a hematological response at 3 months (94.2% vs. 93%), the complete cytogenetic response at 12 months (68% vs. 61%) and major molecular response at 18 months (72.2% vs. 67.6%) were among the study group and control group, respectively. None of them were statistically significant. 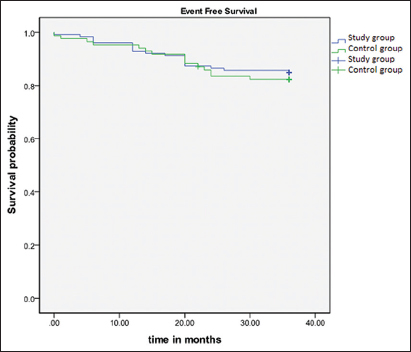 Three years event free survival among the study group and the control group was (85.2% vs. 83.4%) respectively; however, the difference did not reach statistical significant value. Conclusion: This study shows that the outcome of young adults with CML is comparable to those of the elderly people with imatinib both in terms of response rates and survival. Background: The risk of acquiring transfusion transmissible viral infections is said to be higher in patients requiring regular blood transfusions such as those with sickle cell disease (SCD). Aim: We determined the seroprevalence of blood transfusion viral markers among our patients with SCD. Subjects and Methods: This a case–control analytical study consisting of 82 confirmed SCD patients on routine follow-up at our facility in steady state and 90 age-matched controls. Demographic and transfusion history were recorded while 5 ml of blood was drawn for hematocrit levels, and serum tested for transfusion transmissible viral markers for hepatitis B, (hepatitis B surface antigen [HBsAg], hepatitis B surface antibody [HBsAb], hepatitis B e antigen [HBeAg], hepatitis B e antibody [HBeAb], hepatitis B core antibody [HBcAb]), hepatitis C virus (HCV) and human immunodeficiency viruses (HIVs) using the rapid test kits. Ethical approval for the study was obtained from the Institutional Review Board and each participant gave informed consent. Data were analyzed using descriptive and inferential statistics. Results: The seroprevalence of HBsAg, HBsAb, and HBeAg in cases was 2 (2.4%), 7 (8.5%), and 0 (0.0%), respectively, whereas it was 7 (8.5%), 11 (13.4%), 6 (7.3%), and 2 (2.4%) for HBeAb, HBcAb, HCV, and HIV antibodies. Compared to the controls, cases had higher prevalence rate of HBeAb (P = 0.005). No significant difference was observed in those with or without low hematocrit (≤18%) or those that received blood transfusion and those that did not (P > 0.05). Conclusion: We conclude that blood transfusion did not significantly increase the seroprevalence of markers of transfusion transmissible viral infection in SCD patients. Plasma cell leukemia (PCL) is defined by the presence of more than 2 × 109/L PCs in the peripheral blood. It is a very rare type of leukemia with poor outcome. 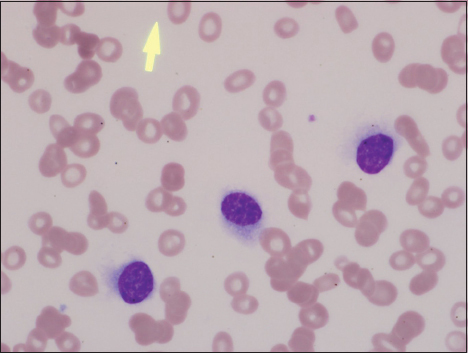 In this case, we report a PCL case with peripheral blood morphology of hairy cell leukemia. We describe the clinical and pathological presentation of a 44-year-old woman who found to have peripheral abnormal hairy lymphoid looking cells confirmed to be lambda specific plasma leukemic cells by flow cytometry. Eventually, this patient managed with autologous stem cell transplantation after conformation of such rare diagnosis and five cycles of VCD regimen “Bortezomib, Cyclophosphamide, and Dexamethasone” based chemotherapy regimen and showed a good response so far. Plasmacytomas are malignancies of plasma cells that may affect skin or other organs. Plasmacytoma of skin is a rare presentation, which may occur either secondary to multiple myeloma or very rarely may originate in the skin. Histopathology with immunohistochemistry is diagnostic. 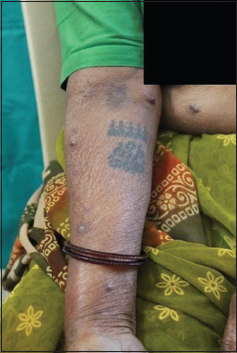 We present a rare case of secondary cutaneous plasmacytoma. Hepatosplenic candidiasis (HSC) is a disseminated invasive fungal infection that develops commonly in patients with acute leukemia. The main symptom of HSC is a persistent fever in patients who have recovered from prolonged neutropenia subsequent to recent chemotherapy. 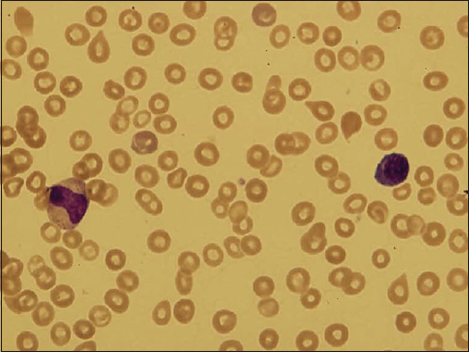 Herein, a case is presented of a 32-year-old man who was followed up at hematology ward due to acute myeloid leukemia and febrile neutropenia related to cytarabine (ara-C) and daunorubicin chemotherapy. HSC was diagnosed and confirmed by ultrasonography, the culture of blood, and biopsy specimen. Diagnostic accuracy studies are known to have different sources of bias. Usually, those biases are not stated clearly in papers and lead to disruption in conclusion. Because pathologists are the producers, readers, or consumers of diagnostic accuracy studies, it is essential for them to know the types of bias that will affect the outcome of the test. This article provides spot light on couple of common sources of bias and their effect on validity and reliability of the results.